On Wednesday, Age of Learning announced that we would make our award-winning ABCmouse.com Early Learning Academy curriculum available free to tens of thousands of low-income families as part of ConnectHome, a new White House initiative that brings together communities, the private sector, and federal agencies to increase access to digital learning and information resources to families across the country. 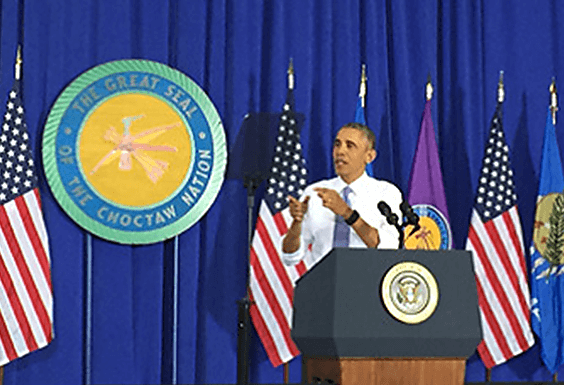 In support of the White House announcement, we participated in a special event at Durant High School in Durant, OK—part of the Choctaw Tribal Nation, one of the 28 communities being served by the initiative—where President Obama shared remarks about ConnectHome. ConnectHome will provide high-speed broadband, technical training, digital literacy programs, and devices for residents in assisted housing units. As a partner in this pilot program, we will make our award-winning ABCmouse.com Early Learning Academy curriculum available for free to families living in public housing in 27 cities and one tribal nation, serving up to 65,000 children ages 2–7 each year. ABCmouse.com will be made available on computers and tablets through a wide range of access points, including computer rooms and learning centers in and near public housing facilities. ConnectHome participation marks another step in Age of Learning’s ongoing effort to make high-quality learning resources available to all children, regardless of their circumstances. Last year, as a participant in the White House’s Invest in US campaign, we made a commitment to provide free access to ABCmouse for SchoolsTM in every U.S. preschool, Head Start, pre-k, and kindergarten classroom over the next two years, at a value of more than $10 million. And just last month we expanded our ABCmouse for LibrariesTM initiative, which provides free access to ABCmouse.com at any public library in the country. For more information about our Education Access Initiatives, including ABCmouse for Schools, ABCmouse for Libraries, and ABCmouse for Community Centers, please visit the Education Access Initiatives page on the Age of Learning website.